As an invulnerable tween, Chris Huegerich, the child of a prosperous farming family, wiped out on his motorcycle in tiny Breda, Iowa. 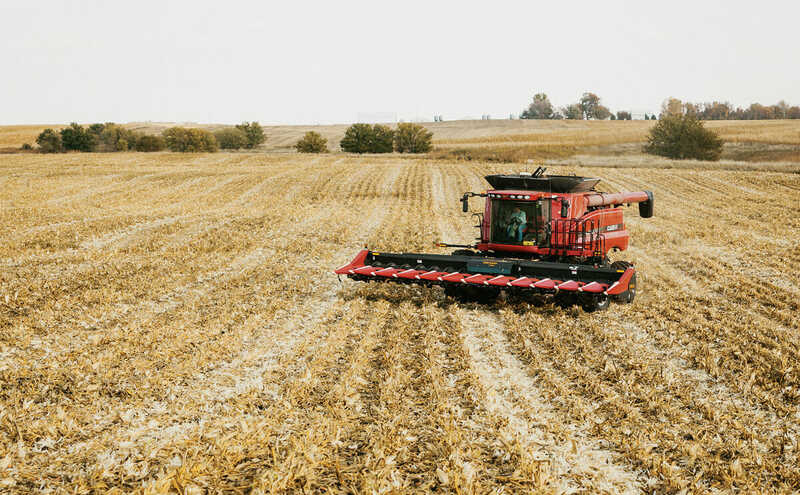 Forty years on, folks still call Huegerich “Crash.” And though he eventually went down a conventional path (married, divorced) and bought out his parents’ farm, Huegerich has recently reverted to his daredevil ways – at least when it comes to choosing what kind of corn to plant. It’s late November, and Huegerich’s 2,800 acres in central Iowa have been neatly shorn to sepia-and-umber stubble. 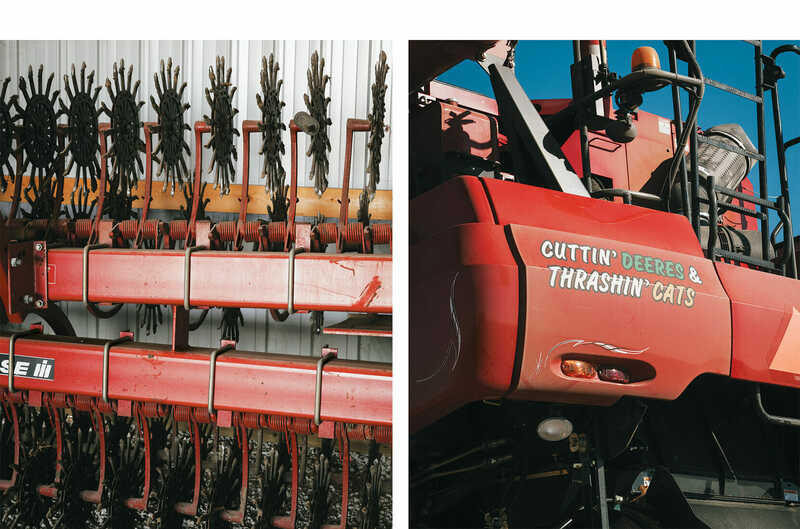 His enormous combines and cultivators have been precision parked – wheel nut to headlight – inside his equipment sheds. But in Huegerich’s office, between the fields and the sheds, chaos reigns. A dozen dog-eared seed catalogs litter a table, along with marked-up spreadsheets and soil maps. For farmers choosing next year’s crop, this is decision time. Buying seeds used to be a fairly simple matter. Farmers picked four or five varieties offered by a regional dealer, and that was that. But in the mid-1990s, biotech companies started producing seeds genetically modified with traits from other organisms. One trait made soybeans resistant to the herbicide glyphosate; another, using a protein from the soil bacterium Bt, helped corn fend off the insects rootworm and European corn borer. Huegerich’s father eagerly embraced the new genetically modified (GMO) seeds. They cost more, but he could save money on herbicides and pesticides. His yields and profits went up, helped in part by good weather and favorable market conditions. But as revenue rose and the years passed, trouble was looming. Just as plants and animals adapt to environmental pressures, retailers respond to consumer pressure – in this case, to label GMOs. Staring at a future of lower corn prices and higher inputs, Huegerich decided to experiment. Two years ago, he planted 320 acres of conventional corn and 1,700 with GMO corn. To his delight, the conventional fields yielded 15 to 30 more bushels per acre than the GMO fields, with a profit margin of up to $100 more per acre. And so in 2013, he upped the ante, ordering six varieties of conventional seeds for close to 750 acres and GMOs for his remaining acres. 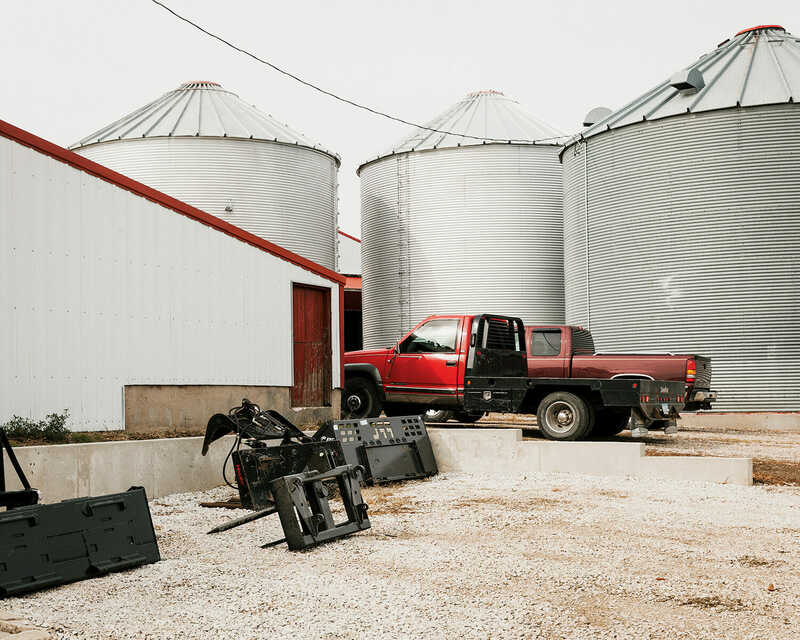 Attachments for a skid loader sit stacked near the silos at Huegerich's home base. After harvest, Huegerich has a busy winter planning for next year's crop. Hugerich Isn’t the only farmer retreating from GMO seeds. In pockets across the nation, commodity growers are becoming fed up with traits that don’t work like they used to. 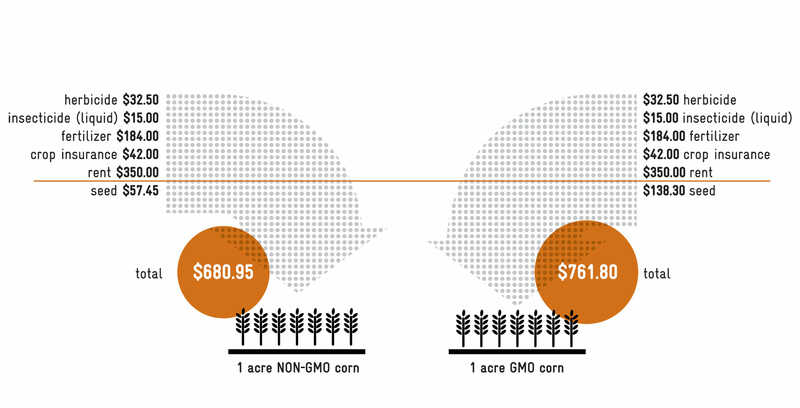 Not only are the seeds expensive (GMO corn can cost $150 more per bag than conventional corn), they’re also driving farmers to buy and apply more chemicals. 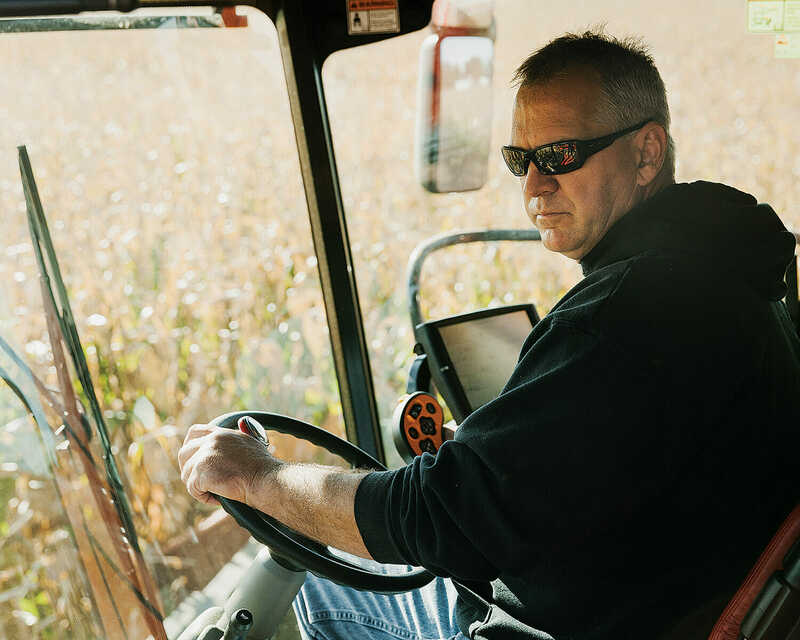 During the growing season, Huegerich sprays both his conventional and his GMO corn twice with herbicides and twice with pesticides, despite the GMO’s theoretical resistance to rootworm. “It gives me peace of mind,” Huegerich says. Between 2001 and 2010, the consumer advocacy group Food & Water Watch reports, total on-farm herbicide use increased 26 percent as weed resistance grew. Today, 61.2 million acres of cropland, including many of Huegerich’s, are plagued by glyphosate-resistant weeds. Just as plants and animals adapt to environmental pressures, retailers respond to consumer pressure. This past March, Whole Foods announced that by 2018 it would label all its foods containing genetically engineered ingredients. In June, Target announced it would debut a line of foods, called Simply Balanced, that would be free of genetically modified ingredients by the end of 2014. And by late summer, more than 20 states were considering genetic modification label laws. 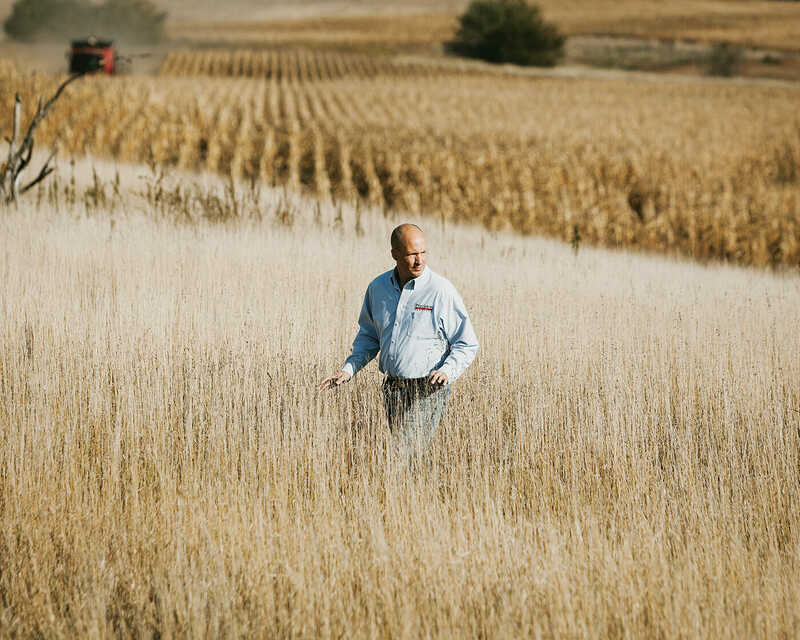 Huegerich doesn’t live near a dry mill that would pay him a premium for conventional corn, or a river that can move his product out into the world. But he does live within trucking distance of Blair, Nebraska, where a Cargill-owned plant converts his crop into plastic for customers who want a bio-based product but can’t get behind GMO corn. “I get a fifty-cent-per-bushel premium,” Huegerich says. Still, winning converts to conventional corn can be an uphill slog. Post-harvest, farmers face a barrage of TV and print ads touting the latest seed technology. There’s a subtler psychology at work, too. Farmers have close relationships with their seed dealers, who often live nearby and keep them company at local baseball games, PTA meetings or church. “You can’t break up with them,” Bloom says, noting that seed dealers work on commission. DuPont Pioneer, for example, offers him a non-GMO corn for $180 a bag, while Wyffels Hybrids sold the same for $115 a bag last year. From left: Rotary hoes neatly stacked in Huegerich's shop; The corn combine shows some attitude. Into this breach, smaller companies that specialize in non-GMO seed have leapt. West Des Moines”“based eMerge Genetics has averaged 30 percent growth in each of the last five years. Sales at Spectrum Seed Solutions, based in Linden, Indiana, have doubled every year of the four it’s been in business. Its president, Scott Odle, believes that non-GMO corn could be 20 percent of the market in five years. After surveying 10 smaller companies focusing on conventional seed in the grain belt earlier this year, Ken Roseboro, editor of The Organic & Non-GMO Report, reported that each saw an increase in demand. “And I think it’s going to continue,” he says. 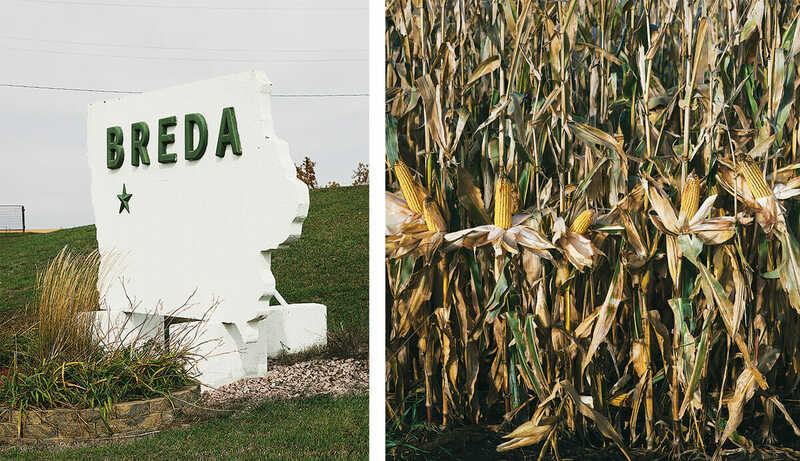 From left: A sign in the town of Breda, Iowa; Non-GMO corn shows its stuff at one of Huegerich's farms. As farmers across the grain belt were contemplating what they’d plant next spring, Masters was in talks with one of the nation’s largest animal feed producers to formulate a non-GMO-verified product. Should the deal come to fruition, it would more than double his company’s size and trigger the opening of several more mills. The article was produced in collaboration with the Food & Environment Reporting Network, an independent, non-profit news organization producing investigative reporting on food, agriculture and environmental health. About time for a follow up, yes? Thanks and looking forward to reading it. I’d like to see you report back when he plants conventional seed on more than 10% of the farm. Part of his success was due to having gmo’s making up the majority of his rotation.